HomeFeaturesWhat’s in it for me? August 2018 Laura Ferrier Features, Production Comments Off on What’s in it for me? AT THE LOCAL RETAIL LEVEL THERE ARE REQUIREMENTS THAT NEED TO BE MET TO BECOME 4R CERTIFIED. THESE INCLUDE TRAINING, RECOMMENDATIONS, APPLICATION, AND DOCUMENTATION. THE ONTARIO 4R Nutrient Stewardship Certification is coming to Ontario. This program originally started in Ohio as a collaborative effort to increase the Great Lakes water quality and to reduce phosphorus loading in Lake Erie. For the past three years, industry stakeholders have been working together as the 4R Ontario Steering Committee to create a plan for Ontario. The 4R Nutrient Stewardship Certification standards were created as part of a voluntary initiative to improve the watershed conditions of the Western Lake Erie Basin. The standards were created to address the following goals: optimize crop uptake of nutrients and minimize nutrient losses; create long-term positive impacts on water bodies associated with agricultural production areas, including the reduction of eutrophication and incidence of harmful algal blooms, and helping to meet water quality standards; encourage sharing of the most up-to-date information about responsible nutrient stewardship with Nutrient Service Providers, growers, and other interested groups; and help the agricultural sector adapt to new research and technology in the area of nutrient stewardship. Farmers are already doing a good job of managing their nutrients, but as a farmer it is imperative to understand that what you put on your cropland might not end up where you anticipate. It could end up running off into the Great Lakes. Phosphorus affects the long term quality of Lake Erie because it provides a nutrient source for algae. As algae grow, they block sunlight and use up the oxygen in the water — effectively creating a dead zone (algae bloom) in the lake. Estimates by the Ontario Ministry of Agriculture, Food and Rural Affairs (OMAFRA) indicate that these algae blooms could cost the Canadian Lake Erie Basin economy $272 million annually, due to losses in fishing, tourism, and other important Great Lakes industries. In an effort to reduce the amount of phosphorus ending up in the lakes, the 4R Nutrient Stewardship Certification is being implemented this fall across Ontario at ag retail locations. 4R is not a new concept for farmers applying crop inputs: right rate, right source, right place, and right time. However, with this new format there will be various audits at the retail level to see how the implementation is going. At the local retail level there are requirements that need to be met to become 4R Certified. These include training, recommendations, application, and documentation. These will be audited at the retail level by Agrichemical Warehousing Standard Association (AWSA) on an ongoing basis beginning with implementation in fall 2018. In order to balance program adoption with credibility, the 4R Ontario Steering Committee has proposed to gradually implement the 4R Certification Program and achieve incremental improvement of best management practice (BMP) adoption. “Farmers can expect a conversation on the importance of using current soil tests to support a science, evidence based and defensible approach to determining nutrient sources and requirements along with adopting effective BMPs to support timing and placement of nutrients. 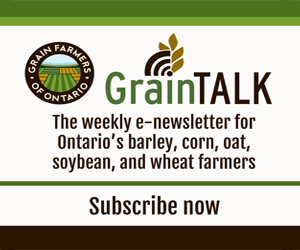 This is a voluntary approach to demonstrating our ability and commitment to reducing nutrient losses past the field edge,” explains Dale Cowan, an Ontario certified crop advisor and senior agronomist and sales manager with AGRIS and Wanstead Cooperatives. As a farmer, there is not that much ‘work’ involved to be included in this program. You need to have your soil tests up to date, know about proper application of fertilizers on farm, and follow other BMPs. You may also have to sign off on a document at your retailer which states that you understand the process. Although you can opt out of agreeing to be a part of 4R Nutrient Stewardship, by agreeing to partner with your local retailer you will be able to do your part in conserving the largest freshwater source in the world. For more information visit https://fertilizercanada.ca/nutrient-stewardship/4rs-across-canada/ontario/ and contact your local ag retailer and communicate to them that you would like to play a part in this initiative to improve water quality. The 4R Ontario Steering Committee is comprised of representatives from Fertilizer Canada, Ontario Ministry of Agriculture, Food and Rural Affairs (OMAFRA), Ontario Agri Business Association (OABA), Grain Farmers of Ontario, Ontario Federation of Agriculture, Christian Farmers Federation of Ontario, Conservation Ontario, The Nature Conservancy — Ohio, Ministry of the Environment and Climate Change, International Plant Nutrition Institute, the Ontario Certified Crop Advisor Board of Ontario, and Ontario agri-retailers.